"Former vice president Al Gore (through his Alliance for Climate Protection) will launch a three-year, $300 million campaign aimed at mobilizing Americans to push for aggressive reductions in greenhouse gas emissions, a move that ranks as one of the most ambitious and costly public advocacy campaigns in U.S. history. ... The climate alliance's initiative, however, will not go unchallenged by climate change skeptics. Americans for Balanced Energy Choices, a nonprofit funded by the coal industry and its allies, is spending about $35 million this election to bolster support for coal-generated electricity. 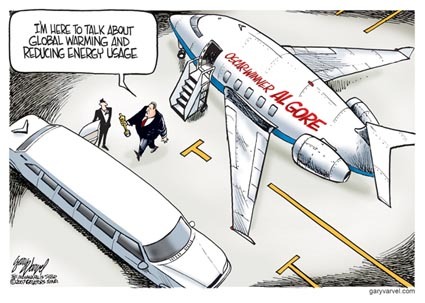 The Competitive Enterprise Institute, a Washington-based think tank that receives part of its funding from oil and gas companies" is attacking Gore. Meanwhile, the Glover Park Group must be laughing all the way to the bank. The public relations firm is working for Gore's Alliance for Climate Protection, and also for the Alliance of Automobile Manufacturers against automobile fuel efficiency standards. For GPG, it's all about billable hours. "air pollution from waste incinerators typically includes dioxins, furans, and pollutants like arsenic, cadmium, chlorobenzenes, chlorophenols, chromium, cobalt, lead, mercury, PCBs, and sulfur dioxide. ... municipal waste incinerators are now the most rapidly growing source of mercury emissions into the atmosphere. .... [It] creates a new solid waste problem that is in some ways worse than the one we have now." "The very idea of putting WTI in a flood plain ... you know it's just unbelievable to me ... I'll tell you this, a Clinton-Gore Administration is going to give you an environmental presidency to deal with these problems. We'll be on your side for a change instead of the side of the garbage generators, the way [previous presidents] have been." "Until all questions concerning compliance with state and federal law have been answered, it doesn't make sense to grant any permit,"
"Al Gore, Read Your Book"
It just seems hard for a lot of people to understand that Gore is not necessarily to be trusted, but most of what he's saying about global warming is true (in the general sense). Environmental issues are real, they're not an elite globalist hoax. But career establishment politicians like Gore are probably not going to give an honest and full account of what's going on and what should be done about it. The real issue is how and why the industrial system we are all a part of was unwilling and unable to make even modest shifts away toward efficiency (let alone toward sustainability). The musician Tom Lehrer is rumored to have said he stopped writing satirical songs after Henry Kissinger got the Nobel Peace Prize, because he supposedly couldn't think of anything funnier than this. In reality, Lehrer stopped performing several years before Kissinger was given the Peace Prize for War (1973), but it is still a good joke. Perhaps it is worth remembering that Mr. Nobel made his fortune through the invention of dynamite, a safe and stable means of handling nitroglycerine -- and Nobel thought that his new explosive would make war so terrible that it would no longer be feasible. The 2007 Nobel Peace Prize award to Al Gore and the Intergovernmental Panel on Climate Change is - like most political decisions - very bittersweet. Gore's film "An Inconvenient Truth" has a lot of good science in it but glosses over his own history of helping make the problems of pollution worse. Gore also shies away from the decentralized solutions that would be needed for a serious, civilization wide effort to address a destabilized climate. In other words, the political elites, corporations and the military industrial complex would have to be converted to use these resources to implement relocalized food production, decentralized renewable energy systems and other efforts that distribute power away from stratified hierarchies. It is likely the Nobel Committee partially chose to give the award to Gore to annoy the Bush regime, similar to their award of the 2002 Peace Prize to Jimmy Carter and the 2005 Peace Prize to the International Atomic Energy Agency (which documented that Saddam Hussein's aborted nuclear weapons program had been effectively stopped before the 2003 US invasion of Iraq). Jimmy Carter was probably the first Nobel Laureate who openly threatened a nuclear war for oil (the so-called "Carter Doctrine" unveiled in 1980 stated that the United States would use any means to control the Persian Gulf oil fields). The IAEA also is a schizophrenic organization, since it simultaneously promotes the illusion of "peaceful nuclear power" while trying to keep countries from covert development of nuclear weapons - even though any government (or corporation!) with a nuclear fuel cycle can acquire the skills to make a nuclear arsenal. The only way to prevent further nuclear proliferation is to abandon nuclear power reactors in favor of decentralized, non-toxic renewable energy. The 2004 and 2006 recipients are very different from Gore, Carter and the IAEA. The 2004 recipient was Wangaari Mathaai, founder of the Greenbelt Movement in Kenya. Mathaai suffered great personal risks and violent attacks to challenge the Kenyan dictatorship for many years, and now is a member of parliament. The 2006 recipient was Mohammed Yunis of Bangladesh, founder of the Grameen Bank (a microfinance development effort that makes small loans to the poor to lift them out of extreme poverty, not focused on merely making profits for centralized financial systems. These movements are parts of the social shifts toward a peaceful world that are less directly connected to overt warfare, diplomacy and peace conferences -- but a clean environment that sustains life, democracy and an end to severe poverty are all prerequisites to a world without war. Two awards that are more grassroots are the Right Livelihood Award and the Goldman Prize. The Right Livelihood Award has been called "the alternative Nobel Prize." This year's award recipients include a farmer who has stood up to the biotechnology giant Monsanto. There were very few genetically tampered crops in 1993 when Clinton and Gore entered the White House. "... for their courage in defending biodiversity and farmers' rights, and challenging the environmental and moral perversity of current interpretations of patent laws". With their fight against Monsanto's abusive marketing practices, Percy and Louise Schmeiser have given the world a wake-up call about the dangers to farmers and biodiversity everywhere from the growing dominance and market aggression of companies engaged in the genetic engineering of crops. The Goldman Prize is probably the most prestigious environmental award on planet Earth. One of the recipients of this honor has spend years fighting an environmental disaster that Al Gore promised to block as a Vice Presidential candidate, but refused to stop once in the White House. The main financier behind the WTI toxic waste incinerator - Jackson Stephens of Arkansas - financed Governor Clinton's campaign for President, the Clinton campaign kept some of its money in his bank, and Hillary Clinton worked for Stephens while at the Rose law firm (she reportedly helped incorporate the WTI incinerator and also served on the Board of Directors of LaFarge Cement, an even larger hazardous waste incineration company). 1973: Nobel Prize awarded to Henry Kissinger and Le Duc Tho for allegedly stopping the War on Viet Nam. Le Duc Tho declined to accept the prize since the war was still underway. 1979: Representative Al Gore votes to exempt the Snail Darter from the Endangered Species Act (a law signed by President Nixon) to get the Tellico Dam built in Tennessee. 1980: Jimmy Carter implicitly threatens nuclear war over Persian Gulf oil fields (the "Carter Doctrine"). Despite this, the shadow government undermined Carter's re-election campaign via a secret deal with the Iranian government to delay the release of the US Embassy hostages until after the election (the "October Surprise"). 1988: Corporate funded environmental groups (NRDC, EDF) agree with Bush administration to deregulate certain chlorofluorocarbons (CFCs) and rename them HCFCs not covered by restriction on ozone layer destroying substances. 1989: Senator Gore writes about the ozone layer destruction that "We cannot afford to wait another 15 years to clean it up." 1990: United Nations Environmental Program warns we have a decade to address the environmental crisis. Smithsonian Institution's Thomas Lovejoy and ocean expert Jacques Cousteau make similar warnings. 1992: Union of Concerned Scientists World Scientists' Warning to Humanity states "no more than one or a few more decades remain before the chance to avert the threats we now confront will be lost." 1992: Al Gore published "Earth in the Balance," which states "Modern industrial civilization, as presently organized, is colliding violently with our planet's ecological system. .... we must take bold and unequivocal action: we must make the rescue of the environment the central organizing principle for civilization." 1992: Al Gore elected Vice President, first promise after election is to block the opening of the Waste Technologies Industries (WTI) toxic waste incinerator in East Liverpool, Ohio. 1993: Al Gore becomes Vice President, promotes NAFTA Treaty. 1994: Clinton / Gore administration declines to promote environmental agenda while Democrats control both houses of Congress. A bill to protect the largest private old growth redwood forest passes overwhelmingly in the House, but is blocked by Senator Diane Feinstein (D-CA) in the Senate. This bill would have protected all six old growth groves in the "Headwaters" forest, about 40,000 acres of second growth and clearcuts, and had money to hire unemployed loggers for reforestation and restoration. 1996 (August 3): Clinton signed away Delaney Clause, a regulation enacted by the Eisenhower Administration that banned carcinogenic food additives and required safety testing for new additives. This was a goal of the Reagan / Bush administration, but the environmental groups fought that roll-back when the Republicans controlled the White House. The Natural Resources Defense Council helped enable the Clinton / Gore elimination of this food safety protection standard. 1996: Before the election, Clinton / Gore made a deal with Charles Hurwitz, the corporate raider who owned Headwaters Forest (via his buy out of the Pacific Lumber Company). The Clinton/Gore Headwaters deal only protected two of the six old growth groves, a few thousand acres of buffer around the old forest, and no money for reforestation and restoration. Pacific Lumber was granted exemptions to environmental laws to destroy the rest of "their" forest. 1997: Vice President Al Gore attends Kyoto Treaty negotiations, refuses to push the United States to enact requirements to reduce pollutants. 1998: Clinton / Gore open up the Naval Petroleum Reserve on the Alaska North Slope to oil extraction (just west of Prudhoe Bay). Clinton/Gore pass the "TEA-21" transportation bill, the largest expansion of the interstate highway system since Eisenhower. 1999: Clinton / Gore administration drop depleted uranium weapons on the former Yugoslavia. 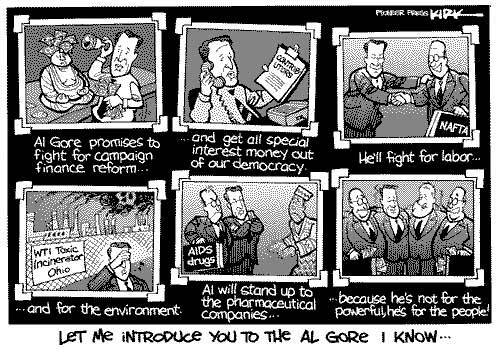 2000: Presidential candidate Al Gore declines to stress environmental concerns during Presidential campaign, challenges vote counting in Florida but declines to demand a statewide recount and disenfrachisement of African American voters. 2001: Vice President Al Gore tells Congressional Democrats not to challenge fraudulent "Electors" from Florida, endorses the Bush / Cheney coup d'etat. Members of the Congressional Black Caucus dispute legitimacy of Florida Electors, but fail to attract a single Senator to co-sponsor their objection, so no debate about the fraud takes place. 2005: Department of Energy contracted "Hirsch Report" states industrial civilization would need two decades to be able to mitigate the impacts of Peak Oil. 2005 was the peak for "conventional" oil. In other words, despite his many flaws, Jimmy Carter was right - but the elites who run the show did not allow him to cope with the energy crisis. 2006: Al Gore's film "An Inconvenient Truth" states "we have just ten years to avert a major catastrophe" from climate change. The film barely mentions his energy policies as Vice President. 2007: Al Gore awarded Nobel Peace Prize for his film. from the advertising for the film "An Inconvenient Truth"
"It took us 15 years to see what we have done to the atmosphere. We cannot afford to wait another 15 years to clean it up." Modern industrial civilization, as presently organized, is colliding violently with our planet's ecological system. .... we must take bold and unequivocal action: we must make the rescue of the environment the central organizing principle for civilization. "on details you will find a range of opinion, around the edges ... but not on the main consensus. The debate's over. The people who dispute the international consensus on global warming are in the same category now with the people who think the moon landing was staged in a movie lot in Arizona." The Tenth Edition of the Concise Oxford English Dictionary defines greenwash (n) as "Disinformation disseminated by an organisation so as to present an environmentally responsible public image. Derivatives greenwashing. Origin from green on the pattern of whitewash." George Monbiot's new book "Heat" picks up where Al Gore left off on global warming, offering real solutions without sugar-coating the large personal sacrifices they will require. by Catherine Austin Fitts Solari, Inc. The day after 9-11, a person whom I respect and care about a great deal said to me, "George Bush was anointed by God for a time such as this." He then asked me what I thought. I said that I thought that the Bush family was anointed by financial fraud, narcotics trafficking, and pedophilia. Stunned, he said, "If that is true, then it's hopeless." I replied that things were far from hopeless, but that for me solutions started with faith in a divine intelligence rather than affirming a dependent relationship with organized crime. Last week I had dinner with a wonderful couple -- activists in the San Francisco Bay Area-- and the woman told me how wonderful she thought Al Gore's documentary An Inconvenient Truth was. She then asked for my opinion. When I gave it, she said, "If that is true, then it's hopeless." We then proceeded to have a rich conversation about why folks who used to call themselves “liberal” or “progressive” are in the same trap as folks who use to call themselves “conservative"
My nickname for our current economic system is “The Tapeworm.” For decades I have listened to Americans from all walks of life insist that we must find solutions within the system – i.e. within the socially acceptable boundaries laid down by the Tapeworm. Believing that our solutions for addressing global warming lie within the system defined by the Tapeworm goes hand in hand with obtaining our media from companies controlled by the Tapeworm, and having to choose from among leaders anointed by the Tapeworm, such as Al Gore. This belief is, in fact, the source of our hopelessness. George Orwell once said that omission is the greatest form of lie. Gore's omissions in An Inconvenient Truth are so extraordinary that it is hard to know where to start. Watching An Inconvenient Truth is more useful for understanding how propaganda is made and used than for understanding the risks of global warming (I am not qualified to judge the scientific evidence here -- I am assuming that Gore's presentation on global warming is sound). In September of 2000, China was granted “Permanent Normal Trading Relations” with the United States when President Clinton signed it into law. Earlier in the year, in a foreign policy speech delivered to the International Press Institute in Boston, Gore stressed that China and Russia should not be viewed as enemies but as “vital partners.” The vice president also said that America has a vital interest in promoting its own economic prosperity throughout the world. “We need to promote the stable flow of investment around the world,” he said. During his speech, no mention was made of promoting minimum environmental standards among America’s new “vital partners”. Since then, companies operating in China have been notorious for their low environmental and labor standards – among the worst in the world. Pollution is rampant. China is second only to the United States in its greenhouse gas emissions and is now building on average one coal-fired power plant every week! China is considered a “developing” country, and as such is not required to reduce carbon emissions under the Kyoto Protocol. After reviewing the actions, and inaction, of the Clinton-Gore administration, it is hard to believe that it is the same Al Gore featured in the documentary, “An Inconvenient Truth”. The Sierra Club accelerated its plunge to environmental irrelevancy, firmly cementing its role as Democratic Party lapdog by awarding its highest award, the John Muir Award, to Carbon Off-set magnate, Al Gore, Jr.
Silly me – I went into “An Inconvenient Truth” expecting a serious, provocative documentary on the damage created by global warming. Instead, I got a 96-minute commercial on the deification of Al Gore. Talk about a bait-and-switch! Yes, the man who (in his words) used to be the next President of the United States is now on the big screen in this self-serving slop where he hosts a slide show lecture on how global warming occurs and what it is doing to the planet. Looking like a corpulent Zeppo Marx and displaying all of the lethargic personality that repeatedly underwhelmed the American voters, Gore’s lecture is among the least riveting stand-up routines to play the lecture circuit. If that’s not bad enough, all of the facts presented in this lecture have been reported widely before and there is not one iota of new information in this offering. What is here, however, is the constant reminder of what a great man Al Gore is supposed to be. We get endless diversions into selected chapters of his biography, where he exploits family tragedies to show how sympathetic he is to the suffering of others (although his sister’s cigarette-fueled death from lung cancer and his son’s auto accident don’t relate to the ecological message). We see Gore looking very serious as he is tapping away on his laptop (the Apple logo is prominently displayed throughout the film), and we see him have supposedly serious discussions with Chinese scientists on their country’s pollution. There are also the obligatory (and, admittedly, deserved) potshots against Ronald Reagan and both Bush presidencies. Al Gore's film, "An Inconvenient Truth," raises the issue of global warming in a way that scares the bejeezus out of viewers, as it should since the consequences of global climate change are truly earth-shaking. The former Vice-President does a good job of presenting the graphic evidence, exquisite and terrifying pictures that document the melting of the polar ice caps and the effects on other species, new diseases, and rising ocean levels. But, typically, the solutions Gore offers are standard Democratic Party fare. You'd never know by watching this film that Gore and Clinton ran this country for 8 years and that their policies -- as much as those of the Bush regime -- helped pave the way for the crisis we face today. The most crucial issue facing humanity is the accelerating destruction of the environment. We are causing a mass extinction of life on Earth unprecedented since the end of the dinosaurs 65 million years ago. Enough toxic and nuclear wastes have been created to poison all life, and our pollution is changing our planet's atmosphere. Humanity seems to have averted global nuclear war only to more slowly ruin the Earth. Here in Maryland, cancer and pollution are at record levels, our forests are clearcut for paper, roads and shopping malls, and politicians are unwilling to consider changes beyond token mentions of "recycling." Could a democratic victory change our seemingly suicidal course? President Bush's policies have been an environmental disaster. The last 12 years have seen massive military spending, virtual elimination of efficiency and renewable energy programs, gutting of health, safety and the environmental regulations, and anti-environmentalists appointed as corporate watchdogs. Bush's energy policy promotes coal and oil burning, opposes modest auto efficiency standards, and is trying to revive nuclear power. His few accomplishments, such as the so-called Clean Air Act, were watered down to near uselessness. The White House is stonewalling on global warming and other severe threats, incurring international wrath. Vice President J. Danforth Quayle inherited the White House effort to gut environmental, health and safety regulations from Bush. His Council on Competitiveness meets in secret to overturn laws that impact on corporate greed. Quayle has shown no understanding of any environmental issue. Senator Albert Gore, Jr. is the only candidate on the ballot who is an environmentalist. His recent book "Earth in the Balance" displays a profound understanding of global warming, ozone depletion and other crises. He states that "Modern industrial civilization, as presently organized, is colliding violently with our planet's ecological system. .... I have come to believe that we must take bold and unequivocal action: we must make the rescue of the environment the central organizing principle for civilization." Gov. Bill Clinton's environmental record in Arkansas can best be described as inconsistent. During his first term, he tried to enforce strict pollution standards on the state's paper mills, but his determination evaporated under the corporate backlash. He doled out huge tax breaks to polluters such as International Paper (which could only find $10 million to take of an offered $29 million handout). Clinton advocates a moratorium on logging remaining old growth forests and a national bottle bill, but not a total transformation to phase out fossil fuels and create a sustainable society. The election is very important for some issues and irrelevant for others. Clinton-Gore would make a difference regarding the banning of ozone-layer eating substances, increased support for renewable energy, and a sweeping change in the top management of federal regulatory agencies. However, the Democrats are unlikely to make deep cuts in military spending (the US military is the world's top polluter) to fund social and environmental programs, let alone stop corporations from destroying the planet. A Clinton-Gore administration would merely slow down the rate that we approach the precipice, not completely reverse course. But even if they would want to "take bold and unequivocal action," it would be very difficult to implement serious change resisted by the bureaucracy and corporations without massive public support. abolition of social safety net - "welfare reform"
My first reaction is to say "only Wired" could do an article on Al Gore reinvented as environmentalist, with not one mention of the Gore family's ownership in Occidental Petroleum. But then again, most US media whore for the political elite. I love the part about Al and Tipper's endless vacations: flying about the globe, burning tons of fossil fuels, obsessing about global warming. The advertisement for Gore's Current TV ignores his involvement in the destruction of Newsworld International. NWI broadcast the Canadian news from the CBC, and newscasts from dozens of countries, with translations when necessary. It was carried by many satellite providers, bringing a much needed balance to America's corporate-agenda-driven news. The mighty vision of Gore wiped NWI from the map, replaced by Current TV, a product placement factory cleverly disguised as a news 'zine for young adults. Once again, technology to the rescue: "using the power of technology to save the world." Neat. We'll burn a bunch of fossil fuels manufacturing our new technological products to save us from burning a bunch of fossil fuels. What vision! Try planting a tree, riding a bike, and recycling for starters. Redux: federal government sells Elk Hills for $3.65 billion to reduce the national debt. At $100 a barrel, it will pay $10 billion over 5 years if Gore's Occidental supplies all the oil to replenish the 100 million barrels withdrawn from the Strategic Petroleum Reserve. Net loss $6.35 billion. Little wonder why Social Security is on the ropes. What's Al's real motivation? Is he holding lots of low-lying coastal property in Florida or something? Is this the same Al Gore who lobbied for 'Plan Colombia'*? ... The most troublesome conflict for Gore is, ironically, global warming, a subject on which he is regularly briefed by the nation's leading climatologists, and which he has mastered at least as thoroughly as he did nuclear disarmament in the 1980s. In addition, Gore has criticized in the strongest possible terms those who would take half measures. "Today the evidence of an ecological Kristallnacht is as clear as the sound of glass shattering in Berlin," he wrote in Earth in the Balance. "How much more evidence is needed by the body politic to justify taking vigorous action?" Environmentalists might well ask that question of the Clinton/Gore administration, whose efforts to slow global climate change have been anything but vigorous. The single biggest step the White House could take to reduce global warming would be to mandate stricter standards for fuel efficiency of cars and trucks. "It makes little sense to continue manufacturing cars and trucks that get 20 miles per gallon and pump 19 pounds of [CO.sub.2] into the atmosphere per gallon," Gore once wrote. Yet the administration has stubbornly resisted raising auto fuel-efficiency standards, even when it had the unilateral power to do so. As part of its War on the Environment, the 104th Congress revoked that power last year, and a new bill to take it away permanently has not been contested by the White House. Katie McGinty, head of the Council on Environmental Quality, describes efforts to increase fuel economy as "tilting at windmills." The vice president's favored solution, she says, is the Partnership for a New Generation of Vehicles, a joint program with the Big Three automakers that commits them to "their absolute best efforts" to produce a commercially viable, fuel-efficient vehicle. But the partnership only requires them to produce a single prototype by 2006, and there's no penalty for failure. "Gore's vivid language in describing environmental problems is almost never matched by equally passionate advocacy for a solution," writes reporter Timothy Noah in U.S. News and World Report, "particularly when powerful economic interests are at stake. Conservative critics who brand Gore an 'ozone man' have it wrong. On the environment, Gore favors extreme rhetoric but only incremental solutions." "Al Gore: A User's Manual"